單個硬盤的俱樂部 – literally ‘single hard club’; more commonly and more tersely known as 錘 (chui) = mace. These are 36 inches long so intermediate between the shinai and half-staff. The maces are quite heavy (solid steel rectangular tapered ‘blade’) and take some skill to move gracefully and effectively. Montara Beach August 31, 2013. The Goose Wing Saber (鵝翼刀) is shrouded in mystery – a very elegant sword called the Yan Chi Dao has similar complex edges near the blade’s tip. 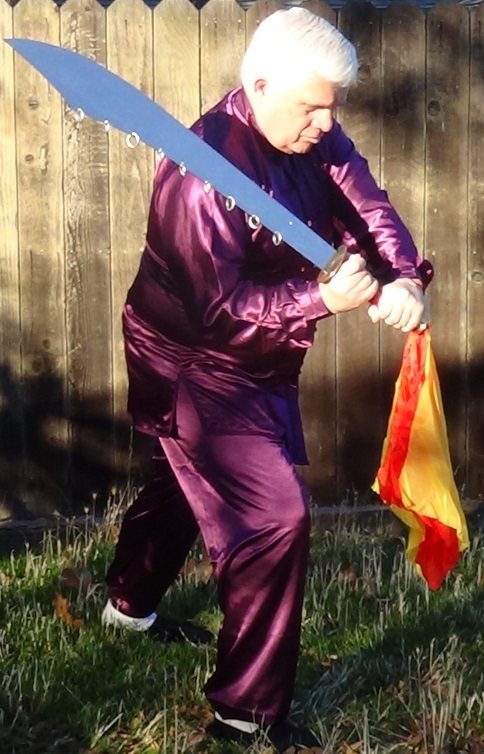 All three of the Yan Chi Daos we have seen are longer with much slimmer blades, more closely related to a straight sword than to a saber. 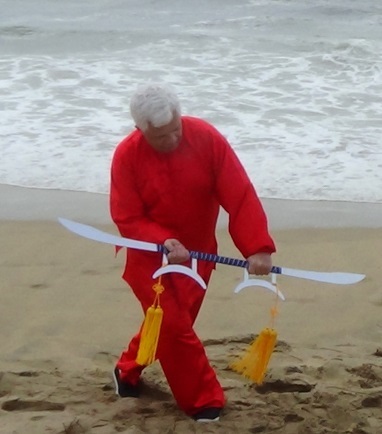 We have enquired if the blade shown above might be from the Wudang Mountain tradition. Montara Beach is north of Half Moon Bay in San Mateo County. It was actually quite overcast, and the drive on Highway 92 was a very slow grind. Upon reflection, so as to speak, blue silks might have worked well also. In the light caused by the weather, the time of day and the surroundings, we thought neither white, yellow nor black silks would have worked well. That just means time to buy green, purple, orange, brown … silks. 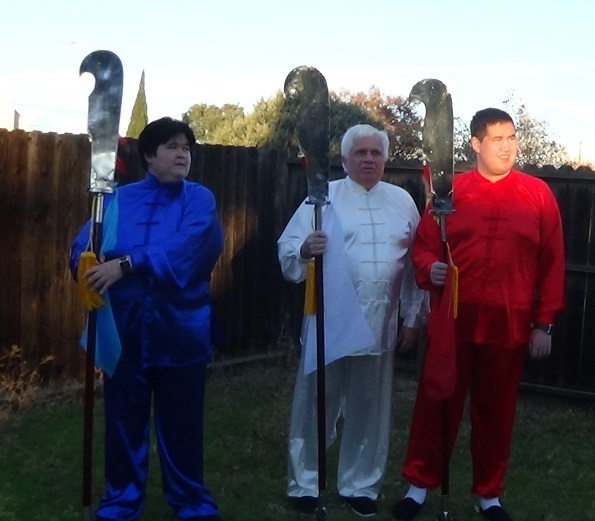 Two weapons were brought along: a Butterfly Wings sword and a Goose Wing Saber.